What’s Life Like at Woodstock? The Woodstock Quadrangle has long been the hub of school life. Elementary school students line up here before classes start in the morning, and play games after school. Students of all ages gather during recess, lunch, and teatime, pass through on their way to music lessons and practices, and, in good weather, may practice right in the Quad. The school’s administrative offices are clustered around the Quad, along with elementary and middle school classrooms. 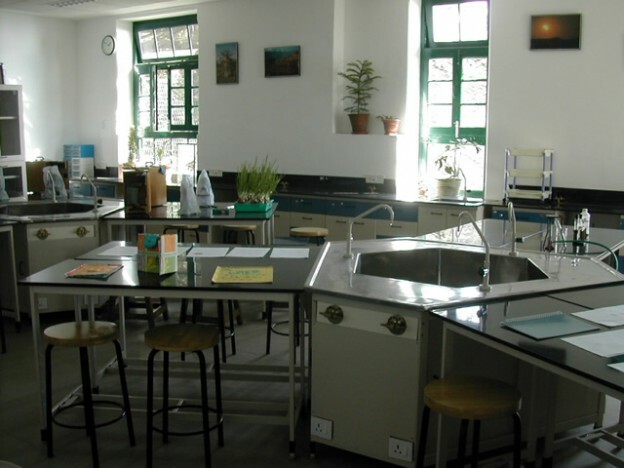 In sum, it looks like pretty much like any other school, science labs (above) and all. This entry was posted in Woodstock School and tagged Woodstock School on December 7, 2007 by Deirdre Straughan.